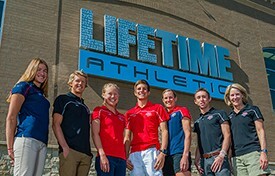 COLORADO SPRINGS, Colo. — USA Triathlon has partnered with Life Time – The Healthy Way of Life Company to create a high performance training environment in Scottsdale, Ariz., for the organization’s Collegiate Recruitment Program, a talent identification program for former collegiate swimmers and runners. Seven identified athletes in the Collegiate Recruitment Program relocated to Scottsdale in January 2014 with the aim of focusing their skills and talent toward an Olympic berth for the Rio 2016 Olympic Games. The athletes and USA Triathlon coaches will utilize Life Time Fitness Scottsdale as the hub for all strength and conditioning activity, as well as swim training and performance testing. The program was previously based at the Olympic Training Center in Colorado Springs. USA Triathlon’s Collegiate Recruitment Program was launched in 2009 to actively recruit Division I swimmers and runners to the sport of triathlon. Through established coaching and mentoring channels, USA Triathlon provides athletes with the skills needed to become elite triathletes and finish on the podium at ITU World Triathlon Series events and the Olympic Games. Gwen Jorgensen, a member of the 2012 U.S. Olympic Triathlon Team and the first U.S. woman to ever win an ITU World Triathlon Series event, became an elite triathlete in 2010 with help from the Collegiate Recruitment Program following her time as a standout runner at the University of Wisconsin. For more on the Collegiate Recruitment Program, visit usatriathlon.org/crp. Life Time Endurance is designed to help people of all levels improve their performance and succeed in endurance events and competitions. Each endurance coaching plan at Life Time includes personal interaction with a certified Life Time coaching professional, customized training schedules, strategic short and long term training and race schedule planning as well as discounts on selected products and services. Life Time Endurance training takes place within Life Time Fitness and Life Time Athletic destinations nationwide and provides a complete health and fitness experience for each athlete including internal health assessments, hundreds of the latest cardiovascular and weight machines, group fitness classes, complimentary child centers and free lockers and towels. About Life Time Fitness, Inc. As The Healthy Way of Life Company, Life Time Fitness (NYSE:LTM) helps organizations, communities and individuals achieve their total health objectives, athletic aspirations and fitness goals by engaging in their areas of interest — or discovering new passions — both inside and outside of Life Time’s distinctive and large sports, professional fitness, family recreation and spa destinations, most of which operate 24 hours a day, seven days a week. The Company’s Healthy Way of Life approach enables customers to achieve this by providing the best programs, people and places of uncompromising quality and value. As of February 14, 2014, the Company operated 109 centers under the LIFE TIME FITNESS® and LIFE TIME ATHLETIC® brands in the United States and Canada. Additional information about Life Time centers, programs and services is available at lifetimefitness.com.